Did you ever wonder what was on the rooftops of New York City buildings? Alex MacLean’s book of photographs, “Up on the Roof: New York’s Hidden Skyline Spaces,” provides a wonderful glimpse of what the country’s largest metropolitan area looks like from the air. MacLean is not only an accomplished photographer, but also a pilot who has created a name for himself by taking aerial images from across the country, ranging from urban areas and city grids to the shapes and textures of fields in the Midwest. “Up on the Roof” shows New York in a unique way. Not only does it focus on the architectural features of the city’s most renowned buildings and skyscrapers, but also the public gardens, tennis courts, rooftop swimming pools, restaurants, art festivals and parks. The photographs also provide more insight into how New Yorkers utilize their space and escape the sometimes clogged and crowded city for a more outdoorsy atmosphere. One of MacLean’s images zeros in on a rooftop oasis that is covered with neatly trimmed grass and equipped with a canopied lounging couch and chaise lounges. The area is also surrounded by sprawling potted plants that demonstrate a small therapeutic and relaxing space surrounded by concrete and skyscrapers. The books also sheds light on the green revolution taking place in America, and how New York fits into that movement. 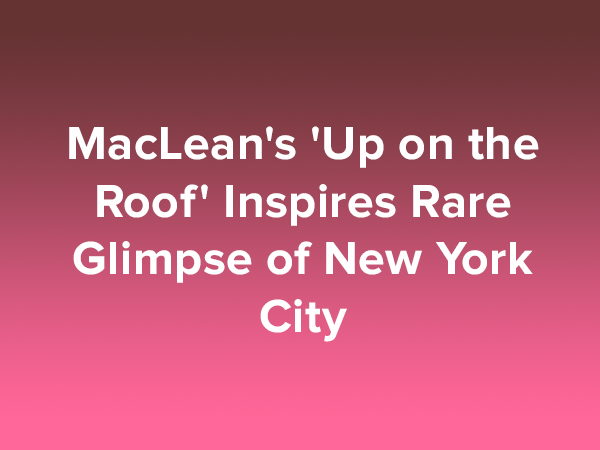 Many of the images displayed in MacLean’s work are solar panels, rooftop gardens and other “clean living” features that are topics of frequent discussion. His work not only demonstrates how the city and its residents participate in greener living, but also show that a cleaner and more environmentally friendly atmosphere is possible even in a heavily populated metropolitan area.